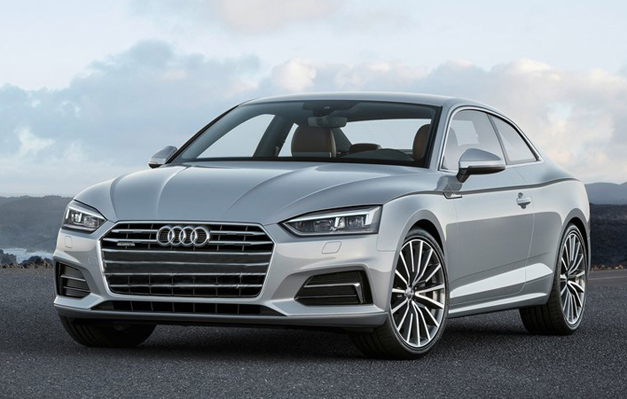 The new Audi A5 has been revealed with the sporty two-door at Audi’s Ingolstadt home. There is slightly very small difference in the conventional A4. The grill of the A5 is a bit lower and wider, and the outward crease above and below headlights add muscle to the car’s nose. The new A5 has wider air intakes and chrome detailing on the bumper with bonnet plug. Audi A5 engine performance is also increased. Audi A5 has both diesel and petrol engine units. The petrol unit is a 2.0-litre TFSI with powerful outputs of 188bhp, whereas there is a choice to pick 2.0-litre or 3.0-litre TDI diesels with an ultra-variant being the most efficient model in the range. For the 3.0-litre diesel engine, the engine performance is increased up to 22% due to less weight, more aerodynamic design and improved engine specs. The new AUDI A5 produces 349bhp which means 21bhp more than the previous model and 500Nm of torque. That means it goes 0-62mph in just 4.2 seconds, 0.2 second lesser than the previous one. It has the maximum speed of 155mph. As a whole, the suspension of whole A5 range has been tweaked and it’s better to drive than ever. The 2.0-litre four cylinder units comes with a manual 6-speed and 7-speed gearbox. Whereas the larger 3.0-litre diesel and petrol A5 is available in eight-speed tiptronic box. Both the heavy engines comes with Quattro all-wheel drive as standard. The new Audi A5 is lesser in weight as 60kgs as compared with the old model. Audi has reduced the weight of the A5 by a total of 60kg compared with the old model. Even then, the wheelbase of the new Audi A5 is slightly loner, which means there’s more boot space available for a new total of 465 litres. The rear seats have folding option. Which means more space for more luggage. Audi A5 has dynamic safety features like traffic jam assist, active lane assist, cross traffic alert and Audi’s pre-sense safety systems. Moreover the new A5 reacts smartly and recognize the traffic sign and parking assist feature. The Audi A5 will appear later in November 2016. The prices are however not announced. Let’s wait and see the curtain reveal for the new Audi A5.